WILLEMSTAD - The three men who were extradited to the United States last year in February may serve their sentence here on the island. 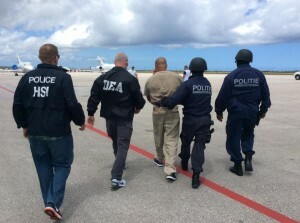 'Ronchi' Rietwijk, 'Greg' Koeiman and 'Kalala' Felesia were sentenced in the USA to prison terms of 5 to 8 years because of drug smuggling from Sint Maarten. When they arrive in Curaçao is not yet known.